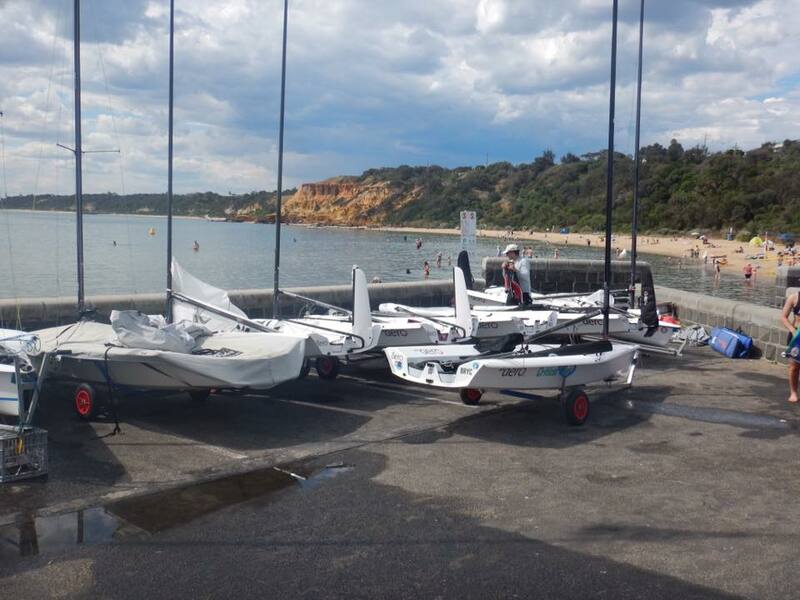 12 Aeros entered for our Victorian State Championship on Melbourne’s Port Phillip Bay: three 5’s, eight 7’s, and I’m pretty sure I saw a 9 out on the water but not listed in the results. Sailors ranged in age between 15 and 65, three made the trek down from Sydney, and young Grace Holligan made a sterling effort flying over from Tasmania. The weather forecast offered anything between variable winds to thunderstorms and a possible 50 knot squall, so it was sure to be challenging and varied! Saturday was just short of 30 degrees Celsius and from memory the AP went up ashore for lack of breeze. But eventually we ventured out and the breeze came in on queue. The first race went well, let’s say 10-15 knots with a small chop. I found myself towards the back of the fleet, peering after the four leading 7’s showing a clear speed advantage upwind. One day I’ll get over my lake habits and work out this sailing into waves and chop business. I believe first step is going to be moving back near the “O” on the “AerO” on the toe strap, and not up against the front of the cockpit. Later the wind had shifted to come from the East, so after waiting in the heat for the course to be re-laid, we set off beating towards the shore, on a shifty breeze. We had a bit of everything on Sunday, with some fine but shifty sailing, and only distant thunder on the horizon. Heavy rain midway through the first race turned the water a spectacular smooth splashy white, with a gentle but reasonable breeze persisting through it, so still sailing. But the images of the sails spread out in that shining rain, against the looming sky, and at one point with sunshine peeking through, was all a fantastic photographer’s dream! But no cameras on hand, so I must just remember it in my mind's eye. Second race was a bit of a soldier’s course, with the race committee determined to get a series result, rather than spend time re-laying the marks. Good call I reckon. Alastair Danks and Chris Brain battled it out up front, Alastair taking the honours both times. Third race and the course was re-laid heading East into the shore, and I hit my straps in the next two final races with less chop and more shifts, taking a 1st and a 2nd. After five completed races, the Victorian RS Aero 5 Champion is Philippa Danks on 4 points (5 bullets), Jacqui Lokum on 8 points. Grace Holligan took 11 points, including a second in Race 3. The 5’s were fast upwind and not far off the 7’s at the top mark once the breeze was in, losing out on the reaches and runs. But still quite quick. I haven't seen combined fleet scores or individual race times, but expect that the 5’s would have troubled the 7's on corrected time in a couple of races. Overall results in the 7’s saw Alistair Danks take the Victorian RS Aero 7 Championship on 6 points, with Chris Brain on 7 points, and myself on 9 points.